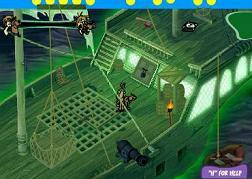 Guide Shaggy and Scooby through interactive action and logic-based puzzles on a creepy pirate ship. click the Small, Medium, or Large link or PLAY GAME button under the picture at left. This opens the game in a pop-up window. Help Shaggy and Scooby solve all the mysteries in the spooky pirate vessel. But don't let them get too scared, or they might jump ship! This game trains logic and concentration. If you like this game, you might enjoy the other Scooby Doo games online on my site. WATCH the scenes for valuable clues. COLLECT inventory items to help you overcome obstacles. KEEP your coolness until the end of the episode. To help you along your quest, the main game screen holds your INVENTORY (where you access stored inventory items). WALK - Use the Arrow keys to move Shaggy and Scooby around. ACTION - Press the Spacebar too perform actions like going through doors, opening doors, picking up objects, climbing stairs, and so on. SAVE - Press the 'S' key to save your game. Make sure to save the game as you go along, so you don't have to start over at the beginning if Shaggy and Scooby get too scared. LOAD - Press the 'L' key to load a previously saved game. EXCHANGE - Press the 'T' key to exchange the selected item with the next one in inventory. PAUSE - Press the 'P' key to pause the game. FEAR-O-METER. This gauge is located in the top-left corner. It measures Shaggy and Scooby's overall fear level. If it fills all the way, the game is over. So don't let them get too scared! SELECTED OBJECT ICON. Located in the top-right corner, this identifies which inventory object is currently active.